Life as we know it ...: Finally -- a countertop decision . . . Finally -- a countertop decision . . . 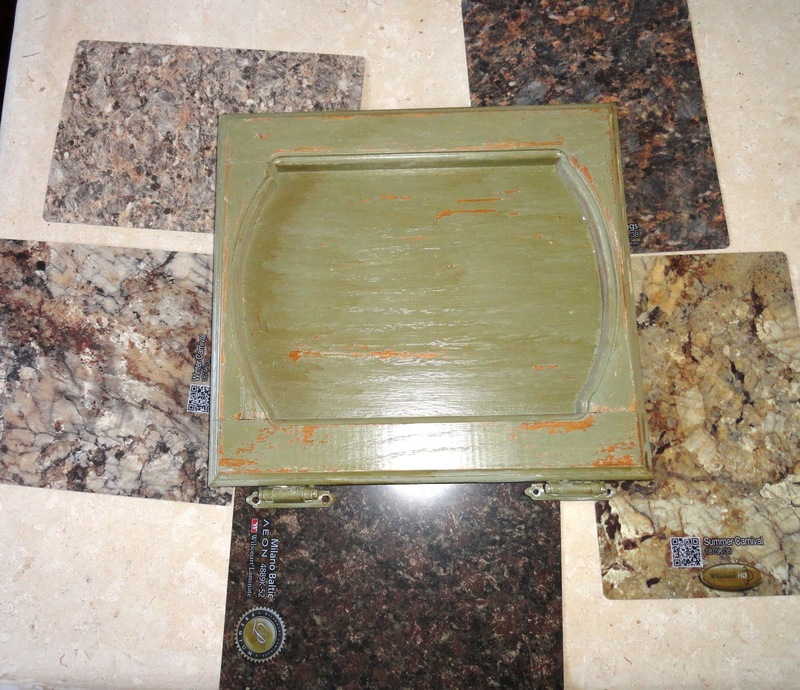 I was looking online at possible counter tops when I noticed that I could order 8 X 10 samples! Great! So I ordered 6 samples just a couple days ago. Well yesterday the samples arrived by Fed Ex -- for free! Well at first I saw only these five and I didn't think any of them were going to look good unless we repainted the cabinets. I asked Mark about that. I thought it might be good to paint the bottom ones black (since the oven and dishwasher are black) and the top cabinets white or beige. If that were the case, there were several that might have looked okay. We really like that stuff. Ours IS, after all, a farm house so that kind of finish seems completely appropriate! But none of the samples looked too good with that green color. But then this morning when I went to move the Fed Ex envelope off the table I found that sixth sample that I had ordered. Apparently they didn't have an 8 X 10 sample of that one, but instead sent a smaller 3 X 5 so it didn't come out when I grabbed the others. And as it turns out, I think that one (called "Crystalline Iris") is the one that's going to work quite well with the green cabinets! And it is a lighter tone than any of the others, too. I like that, as well. And I really like the finish on that countertop -- it isn't smooth like a regular laminate. We thought about getting granite, but decided it really isn't worth the cost (55 square feet X $65 per sq. ft plus installation). We ARE about to retire so we don't want to spend every last dime of our money. And if we ever get around to having to sell the house - maybe 20 years from now -- for all we know granite may no longer be "the thing" in kitchens anymore. And if that turns out to be the case, it really WOULD have been a waste of money. 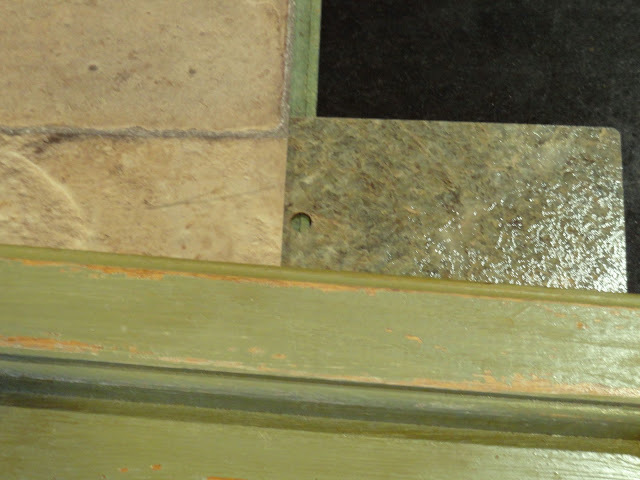 The existing counter was put in when the house was built 30+ years ago. 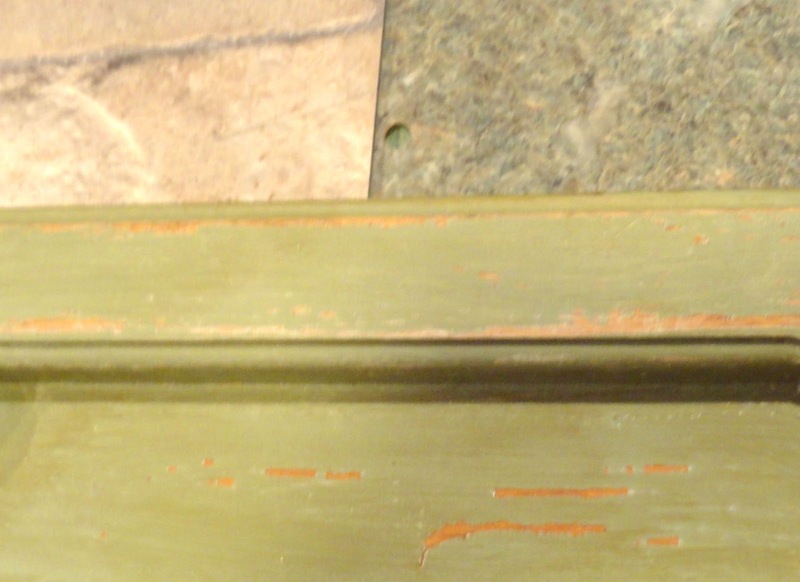 It's a yukky-colored wood-look formica, but it IS still in perfectly good shape. So I doubt that we would need anything any tougher for any reason. We do tend to do most of our work on the big center island with the stainless counter top anyway. And besides -- all our red appliances and tools (and we have a LOT of red ones!) will look just fine on this one . . . way better than on any of those others! 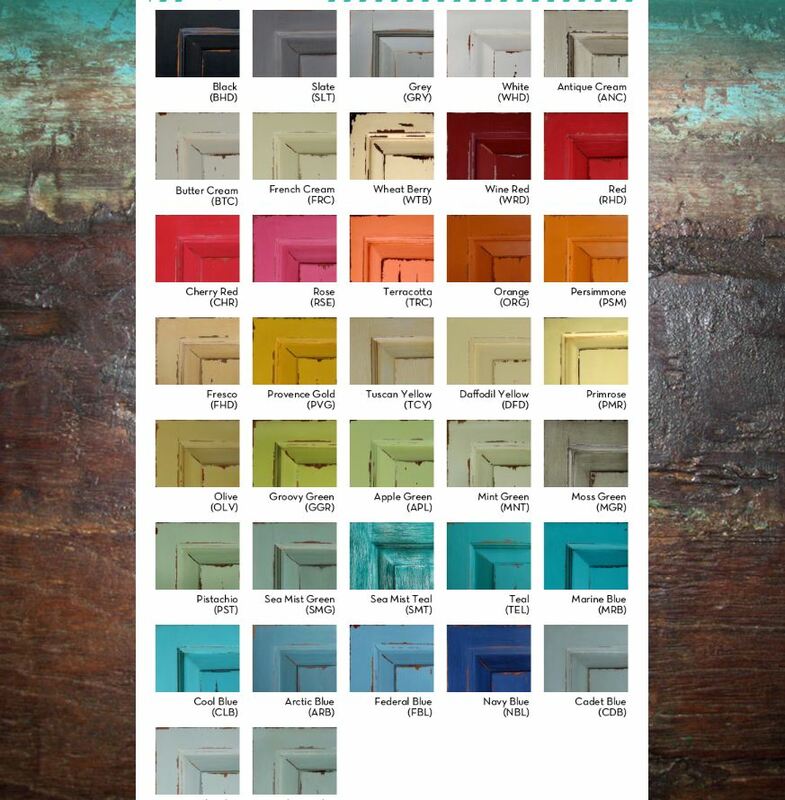 Now -- what color to paint the beadboard backsplash . . . hmmmm.